According to reports in the German newspaper Süddeutsche Zeitung, the administration of the European Patent Office has adopted internal operating rules that, inter alia, call into question basic democratic and trade union rights, such as the right to strike and the right to union representation. More specifically, according to the newspaper, workers’ right to strike is subject to the approval of the head of the European Patent Office, an arrangement that essentially abolishes any union freedom. 1. Can it confirm these reports? 2. What is the regime governing relations between the European Patent Office and the European Union? What opportunities does it have to ensure that this unacceptable anti-labour regime finally ceases? This is about Battistelli’s regime. 1. The Commission is aware of the press reports concerning the changes in the internal rules of the European Patent Office (EPO) affecting inter alia the staff representation. The Commission, however, is not in a position to assess the content of these reports as the EPO is a body of the European Patent Organisation — an international organisation established by the European Patent Convention (EPC) and entirely separate from the European Union. The privileges and immunities of the employees of the EPO are defined in Article 8 of the EPC and the Protocol on Privileges and Immunities annexed to the EPC. Further internal rules establishing the conditions of employment within the EPO also apply. 2. The European Union is an observer at the Administrative Council of the European Patent Organisation but the relations between the two organisations are not governed by any formal agreement. The Commission strongly believes in active social policy and of course expects full respect of all employment rights at all times. 6 suicides later and 3 years down the line there’s neither UPC (which Barnier and Battistelli lobbied hard for) nor employment rights (and possibly no future for the EPO, either). 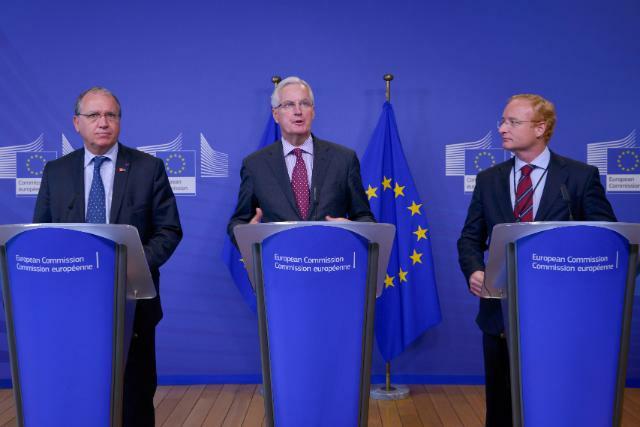 Battistelli is only in the EU when it suits him; the photo at the top is revealing, showing Barnier, Campinos and Battistelli with EU flags everywhere. Battistelli also uses the law only when it suits him, e.g. to bully/taunt a judge in several courts (at great personal cost to this judge).